For the last few months, in amongst other happy commitments, I have been working on an exciting new project which is just about finished. 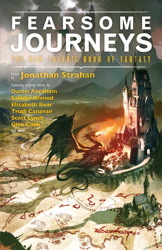 Fearsome Journeys: The New Solaris Book of Fantasy is an anthology of adventure fantasy, with a slight emphasis on military fantasy and swords and sorcery. The working title for the book, Reap the Whirlwind, hinted at the energy I hoped to capture in the book, but Fearsome Journeys fits it best. I am delighted with the book, the stories, the cover, and the idea that this could potentially be the first in new semi-regular series of original fantasy anthologies. That, of course, will depend on how Fearsome Journeys does, but I’m very hopeful for it. And with publication in June, I’m working hard to get it finished and off to Jonathan & co.
All in all, I think it’s a terrific book. The publisher has put together a very handy page that allows you to pre-order the paperback or ebook editions from your preferred retailer. Pre-ordering is a good thing. An intriguing set of authors you’ve got here, Jonathan. And if someone wanted to count heads, (and some people do), half female authors, roughly. This one looks great! I enjoyed Edge of Infinity and it will be fun to read an anthology with these authors focused on fantasy. You had me at K.J. Parker, one of my favorite writers. The anthology looks great and I am glad to see another such collection from Solaris Books after their 2007 “The Solaris Book of New Fantasy”. I am looking forward to read your anthology, sir! A new Black Company story? Count me in! Looking forward to reading this collection very much. Pingback: » Blog Archive » A tisket, a tasket, some gorgeous cover art, Eternal Sky news, and a podcast in a basket. Previous Previous post: Episode 131: Live with Nancy Kress!